TapNLink LPWAN Project Finalist in IoT Innovation World Cup! 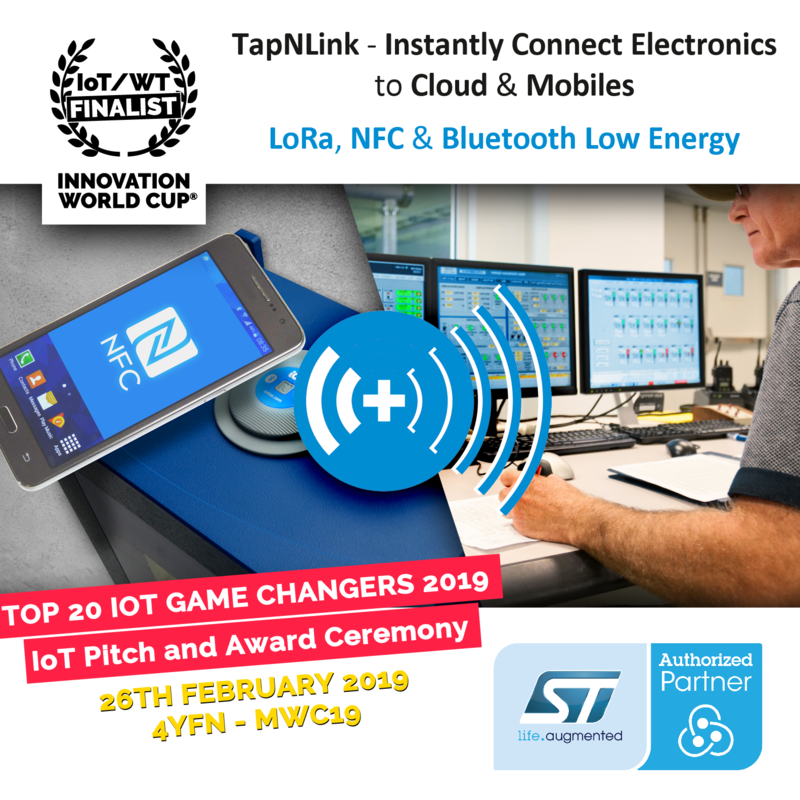 25 January 2019, Montbonnot, France – Today, IoTize™ announced that its TapNLink Local and Remote Monitoring project is a finalist for the 10th IoT/WT Innovation World Cup® in the Industrial category. The project proposes a module that combines LPWAN (LoRa) and local (NFC, Bluetooth) wireless interfaces to support monitoring and servicing of industrial systems. IoTize will be among the finalists showcasing their solutions at the official pitch and award ceremony in Barcelona at the 4YFN-Mobile World Congress 2019 on 26 February at 6:00 PM. The event is hosted by ACCIO, the official Innovation World Cup® Series partner in Spain. The TapNLink Local and Remote Monitoring project is an offspring of IoTize’s TapNLink product line. The TapNLink line already offers NFC, Bluetooth Low Energy (BLE) and Wi-Fi solutions for connecting industrial systems to mobile devices. TapNLink is a complete wireless solution that implements in electronic systems without modification of the target system’s existing firmware. TapNLink enables both monitoring, configuration and firmware updates of the system from mobile devices such as smartphones. Adding LoRa with the NFC / Bluetooth interfaces enables a permanent connection to a Cloud platform. The LoRa connection to an LPWAN supports regular remote monitoring of a system’s status. It may also be used for some remote updates, such as changes to a system’s configuration or modification of local user access parameters. The local connection interfaces (NFC, BLE) allow users, such as maintenance personal, to connect locally over a secure wireless channel and verify the system’s operation, update its configuration or update its firmware. All TapNLink modules feature NFC connectivity based-on the ST25DV Dynamic Tag IC with 13.56 MHz long-range interface. IoTize TapNLink is recognized by the STMicroelectronics’s partner program. The ST Partner Program speeds customer development efforts by identifying and highlighting for them companies with complementary products and services. The program’s certification process assures that all partners are periodically vetted for quality and competence.